Live music and mythology will be in the mix with the launch of the Jeju Music Festival later this month. Jeju Stone Park is the unique setting for the free, inaugural outdoor event taking place August 27-28. The two days of live music begins at 3pm on the Saturday (August 27) with the theme Songs of Jeju Summer and will feature bands Daybrake, Ulala Session, Younha, Epik High, Incredivle and Flowsik. Songs of Jeju's dream is the theme for Sunday's line-up when Oriental Shocus, Soran and Gukkasten perform live from 2pm. The event, which will be free to enter and will have shuttle buses operating from Jeju City to Jeju Stone Park, includes stalls with vendors selling local crafts and produce. The park seems a particularly appropriate venue for a rock and pop music festival since it tells the historical and mythological story of Jeju in rock form. The stones will form the backdrop to another type of 'rock' as the sounds of singers, guitars, drums and more fill the outdoor arena. Show organizer Jeju Tourism Organization (JTO) said it hopes to see the festival grow to attract an international crowd. 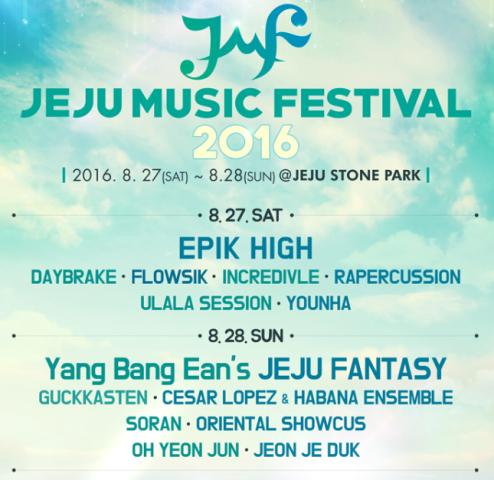 For a detailed event schedule visit Jeju Music Festival website www.jejumusicfestival.com.